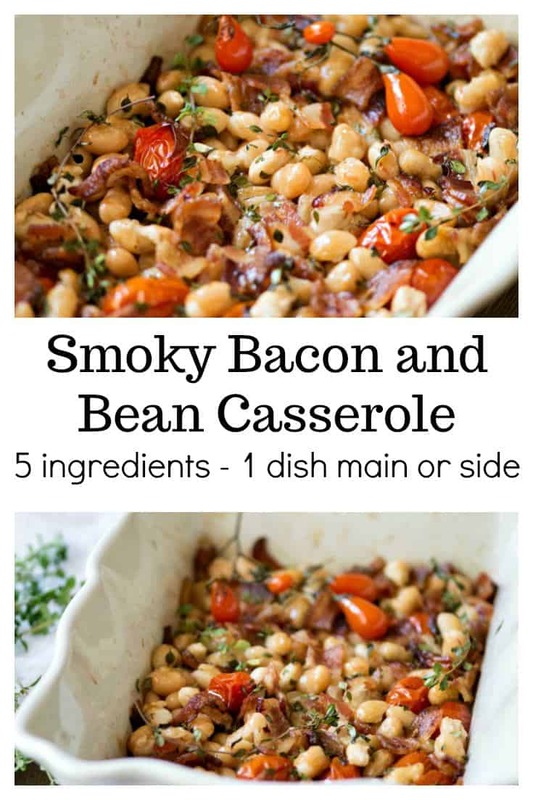 Smoky Bacon and Bean Casserole is my new comfort food. There’s so much to love about it. For one thing, it’s easy enough for beginner cooks to make. With just five simple ingredients and no fancy techniques involved, it’s a dream to make, but it tastes gourmet! It’s also a one-dish recipe which can be served as a main course paired with some crusty bread to soak up the juices, or as a hearty accompaniment to a roast chicken or other simple meat. If you’re still dealing with the dog days of summer, you might not be thinking about hearty, oven-baked foods. Here in Kansas, we’ve been blessed with unseasonably cool temperatures this week, so I haven’t minded using the oven again. I even had to put on a sweater last night! So even if it doesn’t seem like casserole season to you yet, with the kids heading back to school soon, and football season just around the corner, you’ll want to Pin this to make on busy weeknights when you’ve got to feed your crew. 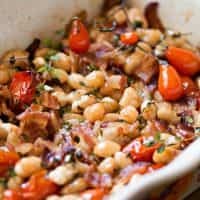 Here’s the thing I love most about Smoky Bacon and Bean Casserole — besides the flavors, I mean — this can all be made in the same dish. (Like my casserole dish? I love the vibrant colors! You can get it as part of a set here.) That means fewer dishes, and fewer dishes make me happy! First, you cook four slices of thick, smoky bacon in it at 400°F for about 12 minutes, just until they’re starting to get crisp. (Thinner bacon requires less time.) I use Premium Hickory Smoked bacon, which I buy in bulk 36 lb. cases, from Zaycon — they’re the people who bring bulk cases of boneless, skinless chicken breasts or ground beef or even Kansas City strips straight to a location near you for so much less than what you’d pay at the grocery store. Related: How to cook bacon in the oven. 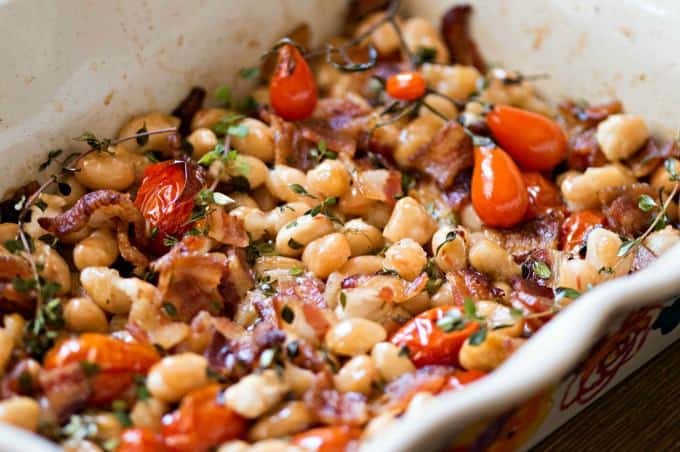 Whatever bacon you use, make sure it’s a smoked variety so you get the depth of flavor that makes this Smoky Bacon and Bean Casserole such a delicious dish. Turkey bacon doesn’t cut it, and maple bacon will change the flavors — though not necessarily in a bad way. Any flavor of smoked bacon works — hickory, apple, whatever your store carries. The only other ingredients you need are a can of white beans (I used cannellini) plus grape or cherry tomatoes, chicken stock, and fresh thyme. 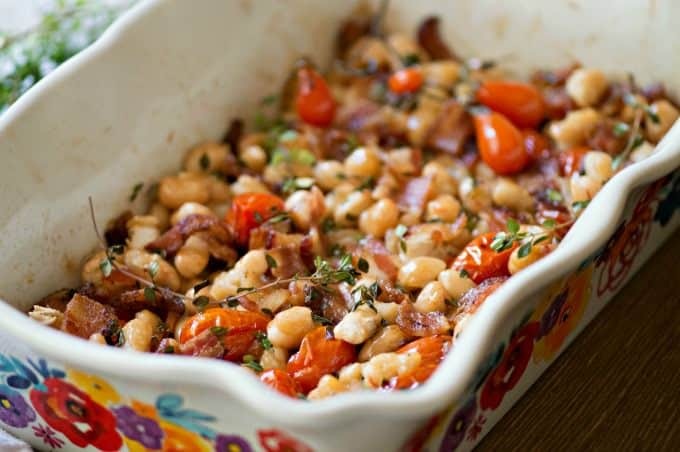 Once your bacon is cooked, drain all but 1 to 2 tablespoons of the fat and throw in your grape or cherry tomatoes. Let those roast at 400°F for 8 minutes while you chop the bacon then drain and rinse the beans. Oh, and run your fingers along the stems of the thyme sprigs to pull off the leaves. I left a few sprigs intact just for the pretty picture but you don’t want to eat those things. 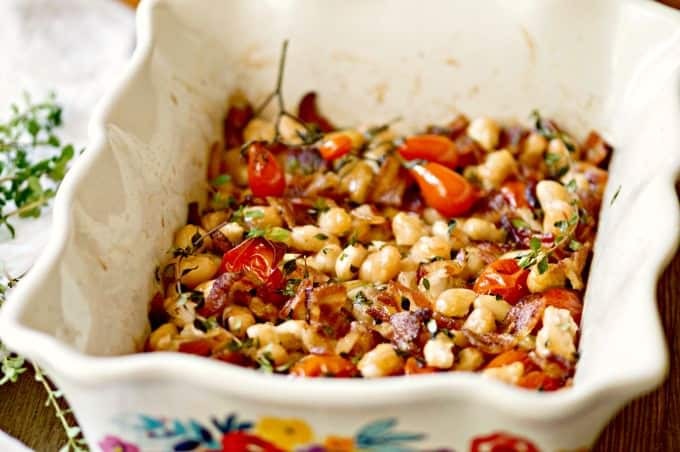 Once the tomatoes have roasted, add the crumbled bacon, beans, thyme, and 1/2 cup of chicken stock to the pan. Give it all a good stir and pop it back into the oven. 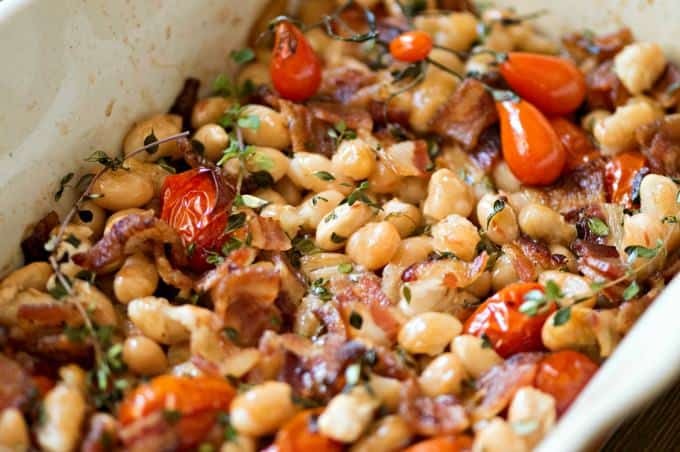 You don’t need salt thanks to the bacon and beans. Yep, it’s a 5-ingredient recipe that can act as a main dish or a side — what’s not to love about that? Just five simple ingredients and one dish are all it takes to make this casserole that can serve as a hearty side to a roast chicken dinner or stand in for the main dish when paired with crusty bread. Arrange bacon slices in a 9x13" casserole dish. Bake at 400°F for 10-12 minutes, just until crisp. Remove bacon from the dish and drain all but 1-2 tablespoons of bacon grease. Add tomatoes to pan and stir to coat. Roast them at 400°F for 8 minutes, until they begin to soften. Stir in thyme leaves, chicken stock, and beans. Return to oven for 8-10 minutes until fully heated. Serve. If you happen to have leftovers, don’t fret. It reheats very well. Or, you can quickly turn it into soup for lunch the next day by adding more chicken stock and a handful of fresh spinach!